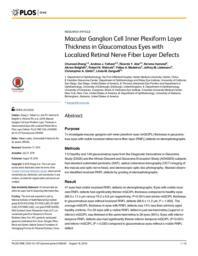 To investigate macular ganglion cell–inner plexiform layer (mGCIPL) thickness in glaucomatous eyes with visible localized retinal nerve fiber layer (RNFL) defects on stereophotographs. 112 healthy and 149 glaucomatous eyes from the Diagnostic Innovations in Glaucoma Study (DIGS) and the African Descent and Glaucoma Evaluation Study (ADAGES) subjects had standard automated perimetry (SAP), optical coherence tomography (OCT) imaging of the macula and optic nerve head, and stereoscopic optic disc photography. Masked observers identified localized RNFL defects by grading of stereophotographs. 47 eyes had visible localized RNFL defects on stereophotographs. Eyes with visible localized RNFL defects had significantly thinner mGCIPL thickness compared to healthy eyes (68.3 ± 11.4 μm versus 79.2 ± 6.6 μm respectively, P<0.001) and similar mGCIPL thickness to glaucomatous eyes without localized RNFL defects (68.6 ± 11.2 μm, P = 1.000). The average mGCIPL thickness in eyes with RNFL defects was 14% less than similarly aged healthy controls. For 29 eyes with a visible RNFL defect in just one hemiretina (superior or inferior) mGCIPL was thinnest in the same hemiretina in 26 eyes (90%). Eyes with inferior-temporal RNFL defects also had significantly thinner inferior-temporal mGCIPL (P<0.001) and inferior mGCIPL (P = 0.030) compared to glaucomatous eyes without a visible RNFL defect. The current study indicates that presence of a localized RNFL defect is likely to indicate significant macular damage, particularly in the region of the macular that topographically corresponds to the location of the RNFL defect.